Today we look at two current exhibitions at the San Francisco Museum of Modern Art (SFMOMA) that opened in October and continue through mid-January: Richard Serra Drawing and Sharon Lockhart’s Lunch Break. I had the opportunity to attend the museum’s press preview for both of these exhibitions and posted live updates via my Twitter feed @catsynth (the hashtag was #serrapreview). 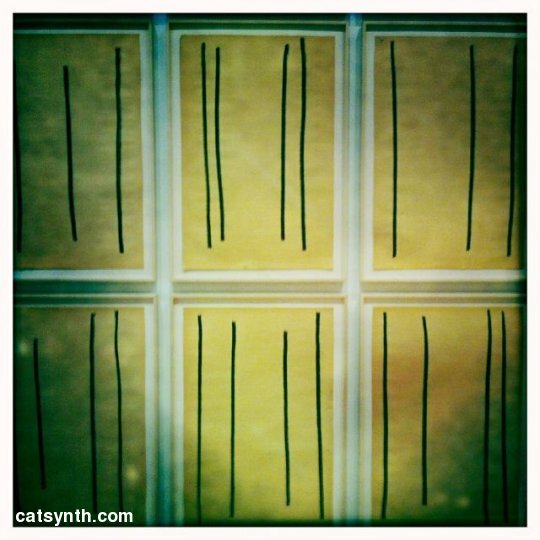 The main event of the day was the opening of Richard Serra Drawing. I have long been fond of Serra’s large-scall metal sculptures. The minimalist yet strong constructions of flat steel planes or gently curving metal are instantly recognizable as his. This exhibition was my first experience with his drawings and sketches. Many of the pieces had the same characteristics as his sculptures, the reliance on strong geometric forms in a minimal presentation, such as his 1973 piece Untitled. One could see this piece as the shadow of one of his sculptures. Several of the pieces rivaled his sculptures in scale. However, to simply describe the work in this exhibition as Serra’s sculptures flattened to two dimensions would miss most of what makes it unique and surprising. Many of the large black pieces are done with painstick, and the large geometric shapes which smooth from a distance have a very rich and rough texture. However, to simply describe the work in this exhibition as Serra’s sculptures flattened to two dimensions would miss most of what makes it unique and surprising. Many of the large black pieces are done with painstick, and the large geometric shapes which smooth from a distance have a very rich and rough texture. It was something I referred to while visiting as “liquidy roughness.” The texture and medium also allowed Serra to move beyond basic geometry into forms that cannot easily be realized as sculpture. In out-of-round X, an exaggerated texture is present in the main circular shapes, and continues to diffuse out past its edges. It is not a simple graduation where the texture becomes more diffuse from the center, there is still some semblance of a geometric shape in the image. But it is nonetheless unlike any of his sculptures, and I would not have automatically marked this as Serra’s if I saw it from a distance outside of the exhibition. Indeed, more organic circular shapes and ambiguous edges abound in Serra’s drawings. He also escapes from the solid or semisolid forms with line drawings that add more empty space. In these drawings, he reduces the drawings to one-dimensional forms in a way similar to his use of planes in three-dimensional space. The gallery presentation provided a chance to see the diversity of the works side-by-side, but also left a large amount of empty space that abstract pieces truly need to be appreciated. I liked this location which featured Diamond (1974/2011) in the foreground and the circular Institutionalized Abstract Art (1976/2011) around the corner. Both were redrawn on the walls for this exhibition. They are perhaps the most minimal of all the pieces, and as such benefited the most from the context of gallery and the association with the other works. They provided a contrast to more roughly drawn or textured pieces. The spacious presentation also allowed room to explore the shapes in a personal manner. One wall of pieces entitled Drawings after circuit featured simple lines against aging paper, and seemed ripe for interpretation as a Hipstamatic photo. The notebooks, while not as monumental, presented another dimension of Serra distinct from both his large drawings and his sculpture. We see the freedom to explore shapes and ideas that don’t yet need to stand up in large scale. There are not only small sketches of ideas that could be used in larger works, but energetic and curving sribbles and even playful human shapes. The notebooks serve more as inspiration for visitors (particular visitors who are themselves artists) than as works unto themselves. 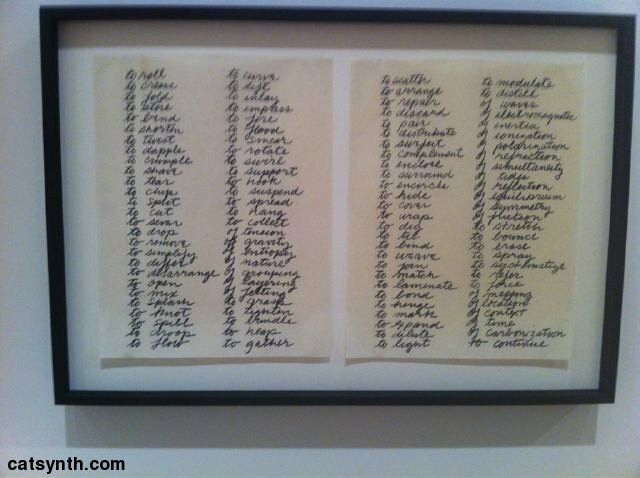 Perhaps the most unusual piece was the list of verbs that appeared at the beginning of the exhibition. It could serve as both an artist statement as well as an art piece. 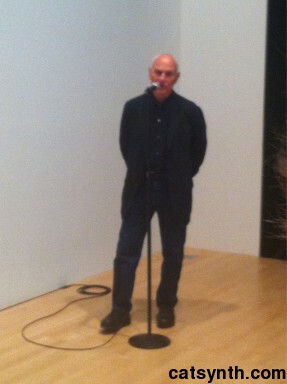 At the end of the tour, Richard Serra was present to discuss the exhibition and take questions from the press. He had a very clear and accessible way of describing his work and process, as much engineer as artist. It was interesting to hear him describe traditional architecture he saw in Spain and Turkey as sources of inspiration for his work. I associate stylized form and intricate detail with such architecture, and what attracts me to Serra’s work is its break with these traditions for a more simple focus on large-scale textures and geometries, and the exploration of asymmetry. I did not get a chance to ask any questions myself, squished among members of the established art press, but it still good to just be present and listen. Sharon Lockhart’s Lunch Break is quite a contrast to the Serra drawings in media, style and subject matter. Through photographs and film, Lockhart presents a personal-scale view of industrial labor at the Bath Iron Works, a large naval shipyard in Maine. The artist spent a year in the town and at the shipyard, “interacting with workers and gaining their trust and collaboration.” The result is a portrait that is both intimate and detached. In the photographs we see everyday objects and elements of the “shadow” economy among the workers, such has makeshift cafes and lunch stands. The film meanwhile turns a short period of the workers on lunch break into a monumental portrait of industrial life. The film is based on ten minutes of footage tracking along the a 1,200 foot hallway, without any panning, zooming or any other motion of the camera besides the steady forward progression. Along the hallway, workers go about the normal routines during lunch break, sitting, standing, eating, reading, talking However, what we ultimately see is anything but routine. The film is slowed down to 80 minutes (one eighth the speed of the original). The result is a stretched out abstract industrial exploration, which emphasizes the expanse and straight lines of the hallway as we pass by the workers. The music, a similarly slowed down mixture of sounds collected from the factory space by filmmaker James Benning and composer Becky Allen, gives a heightened sense of a fictionalized industrial landscape. Of course, I immediately started deconstructing the sound, which appeared to be a combination of pitch and time shifting and granular synthesis, but this did not detract from the overall presentation of the film, which was projected on the wall of a dark elongated room with surround sound for an immersive experience and other worldly experience. Although the film itself was interesting to watch, it was the music that kept my attention for an extended period of time. I tended less to see the details of workers in the visual and focused more on the big picture of the hallway, while in the music I kept looking for details, little bits of metallic or machinery sounds, or the occasional hint of human activity, amidst the overall drone of low-frequency noise. It is hard to give a sense of the piece, with just an image. It should be experienced in person with the full sound. The photographs that accompanied the film were not altered and presented images of the lives of the workers at the shipyard that would normally be hidden to outsiders. Several of the workers have set up small shops that sell coffee and food and operate as a shadow economy, where people leave money in boxes on an honor system. The images are impersonal in the sense that they do not include any people, but the personalities of the workers who created the objects and spaces are indirectly present. In contrast to the film, with the industrial sounds of the music and scale of hallway dominate the viewer’s attention, the images and silence leave the viewer free to imagine the people who wrote the signs on the shops or attached the stickers to the lunch boxes. In particular, that was my impression from the sign “Please don’t forget to put money in the bank” with its accompanying smiley face. This sign forms the cover for exhibition catalog as well. Although Lunch Break presents it subject with a certain detachment and abstraction, it is hard to separate it completely from the economic and political reality of contemporary life in the U.S. As stated in the official release, “The project’s attention to the local and to the rarely portrayed experience of the working class take on a particular social and political relevance in the context of global capitalism, war, and economic recession.” The opening was occurring at the same time that the Bay Area incarnations of the Occupy movement were just picking up momentum (my first visit to OccupySF was just a few days earlier.) The combination leads to interesting questions about how protest, art, and the daily routines of working people intersect (and how they often don’t). It was interesting to have seen both of these exhibitions together, and then reflect on them side-by-side several weeks later. My experience of Serra’s drawings is defined by shape and texture, and leads to more internal contemplation and fewer words that reflect the scale and space of the exhibition. By contrast, Lockhart’s Lunch Break speaks to me on a technical level with music, film and photography, and is on a personal scale. As such, it leads to more words and thoughts upon reflection. Both are valuable experiences and ways of seeing art. Both exhibitions will be on view at SFMOMA through January 16, 2012. I strongly recommend checking them out if you are in the Bay Area. It was particularly interesting in the context of the theatre itself. This was one of those classic cavernous movie theaters with stylized art-deco details, but with very contemporary abstract lighting in deep blues, reds and violets, as can be seen on the right side of the image above. It was in this context that we set up on the floor of the theater and made music. Basically, the performance was a collection of bleeps and bloops, noises, glitches, loops, crashes and snippets of melody and harmony here and there. Nonetheless, it was all musically done with phrasing and dynamics, loosely “conducted” with ongoing whispered directions from Suki O’kane. In order to keep things light, I bright a very small setup, consisting of red Korg Kaos Pad, an iPhone now loaded with multiple software synthesizers, a circuit-bend instrument with photovoltaic modulation, along with a small mixer and amplifier. As expected, it was difficult to pay attention to the screen during the performance, while attempting to manage the instruments and listen to the other performers. Fortunately, I did get to see the first half of the projectionist jam with another group providing the music: POD BLOTZ (Suzy Poling) and lazyboy (Bruce Anderson, Dale Sophiea and Gregory Hagan). The combination of images, sounds and environment combining old and new elements, noises and images, was quite captivating. I would also be remiss if I didn’t mention the beer from Linden Street Brewery. I particularly liked the stout. I have been viewing on and off a collection of short films by Stan Brakhage. Brakhage was a very prolific and influential maker of short experimental films. Most of his films have little or no narrative, and in many cases are made from images created directly on the film (i.e., not filmed with a camera), as in the case of thethe frame from Resurrectus Est shown to the right. Most of the films are also silent, leaving the viewer to focus exclusively on the images. One of the films that intruiged me was Cats Cradle, originally done in 1964. Basically, it consists of a series of clips of a black cat interspersed with separate closeups of a man and a woman (apparently there were two couples in the film, but was not able to see this as I was watching). The cuts are frequent and the lighting/tinting is an amazing shade of red/magenta. It really is hard to describe, though you can find a better attempt here. An interesting suggestion is that the film can be seen as the “cat's perspective” on the couple. The film definitely has a sexual feel to it, though there are no explicitly sexual images (discounting the fact that juxtaposing images of a woman and a man usually adds some sense of sexuality). How does the cat fit into that overall sense? Juvenile word-associations aside, cats have a history of association with (female) sexuality and fertility, most notably through the Egyptian goddess Bast. Bast is definitely a goddess for my personal pantheon, and I've been looking for an excuse to use her in a post on this forum. Bast has quite a resume, as the protector of cats, women and children, also associated with perfume, fertility, love, music and dance. It is interesting to consider Cat's Cradle in the context of Bast, even as a tribute of sorts, although I have no basis to assume Brakhage had such an association in mind. Though looking through his filmography, i think he was fond of cats.